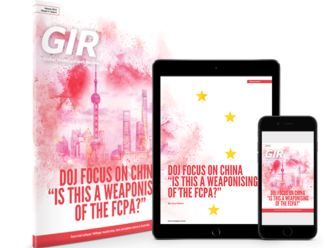 Global Investigations Review is read by an audience of world-leading investigations professionals across 195 countries. Our 10,000-strong audience includes private practice lawyers, corportate counsel, forensic experts, risk advisory consultants and government agencies. From the leading pioneers who have shaped their legal landscape, to the rising stars who are aiming for the top. Partnering with GIR gives your campaign direct exposure to leaders and influencers that have the spending power to impact your business. To learn more about how you can reach our audience, please contact kieran.hansen@lbresearch.com, or call +44 (0)20 3780 4115 for further details.